Shooting Review: Ruger American Pistol Service Model | Eagle Gun Range Inc. The Ruger American Pistol is the manufacturer’s new made-in-America, striker fired pistol. It’s a full-size sidearm appropriate for duty or open carry. It comes in 9mm and .45 Auto. Here we’ll focus on the 9mm model. This new Ruger American has some interesting features and deserves a thorough and in-depth look. While you can gain more insight into the details on the Ruger website, this review will be a first-look shooter’s review, focusing on the construction, external features, and performance. This is a full-size service model pistol, but even so, the first time I picked it up it seemed heavy. I later found out that there’s a good reason for this: the billet steel modular chassis system riding inside of the polymer frame. More on that in a bit. At 30 ounces unloaded, though, it’s still on the heavy side. I learned more, both to like and to nitpick on, when I started shooting. First, let’s get to know the specifics of what we’re dealing with here, with some specification details. Three or four shots into my first experience with this pistol several things became glaringly apparent. First, despite the small diameter of the grip I found the trigger reach a bit too long for my medium-sized hands. Next, I noticed that the complete lack of grip texture on the sides allowed my support hand zero purchase, causing the pistol to move around in my grip more than I like. But then I noticed that my rounds were pounding the center of the target! After 100 or so rounds, I concluded that this new Ruger pistol was, for me, very accurate. I especially found it easy to get connected hits at 10 and 15 yards, even when shooting slightly faster than 1 shot/second. Easier, in fact, than with my beloved Glock 19. The 3-dot sights (though the rear sight is sloped and not appropriate for one-handed slide racking) were very easy to pick up in the low light of the indoor range and I just found it very easy to reacquire and put accurate hits on paper. I’m surprised and impressed with how easy it is for me to be accurate with this pistol. The grip itself I found to be quite comfortable. Though the Ruger American Pistol has three different wrap-around backstrap sizes, I only used the medium one in my shooting. In my hands, the grip seemed smallish, which made it surprising to me when the trigger reach was a bit too long. My trigger finger touched right at the tip and I sometimes had trouble engaging the trigger safety. I had to slightly modify my grip to make trigger engagement more comfortable. Grip is highly individual, so my experience is anecdotal. This fit feature will vary from person to person. The trigger is not so comfortable to me, given the overlong reach, overextended trigger safety and long reset, but more on that below. The only insurmountable problem I found on this Ruger out of the box is the terrible texture, or lack of it, on the grip. When shooting multiple shots with both hands, even though I gorilla-grip my pistols, the gun moved around in my grip too much, owing to a complete lack of purchase for my support hand. I know that this failing is common to almost all pistols and can be fixed with skate tape or stippling. I just hate that not a single firearms manufacturer has properly addressed this issue (other than Glock’s RTF model grip). Ruger touts their “scientifically engineered system” for reducing felt recoil with a new barrel cam design. I’m afraid I’m not familiar with the relevant specifics of this new cam, but I found the recoil on the Ruger American to be quite pleasant. Their barrel cam effect along with the relatively low bore axis seems to do a good job. I found it easy to keep sights on target shooting multi-shot strings, which is not so common with a full-sized, long-slide pistol. Here’s where I’m going to get pretty nitpicky. Despite Ruger’s promotional claims I’m not entirely happy with the controls complement on the pistol, with a couple of exceptions. Starting with those, I think it’s great that the magazine release and slide lock controls are ambidextrous, and suit righties and lefties, right out of the box. Great decision on Ruger’s part (And, by the way, it’s not just great for handedness; ambi controls make a pistol a better fighting tool, should one hand/arm get injured while you’re defending your life!). The trigger I’m not such a great fan of. The weight and length of pull is not bad at all. Not so great are 1) the spongy wall/break and 2) the looooonng reset. The reset especially had me fighting with the gun, as I short stroked the reset a few times when shooting. One can learn one’s trigger in time, sure, but a long reset is simply not optimal. 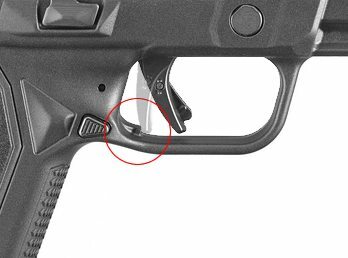 I found it interesting that Ruger put a trigger stop on the bottom of the trigger guard to physically prevent over travel. I’ve never seen that before. Clever little thing they did there! These issues aside, I found the trigger itself to be uncomfortable. The first element of discomfort is in how the trigger safety sticks pretty far out from the trigger bed. Too far, in my opinion. Since the trigger reach was long for me, the safety poked me in the fingertip and I had trouble engaging it properly to allow for a successful trigger press. The next issue of discomfort came in how the trigger safety depresses deep into the trigger bed, leaving some sharp-ish edges in the middle of the trigger. Bottom line is, after shooting only 150 or so rounds, my fingertip was sore; and I already have a callous from shooting a Glock trigger in training several times a week. The slide lock is nicely contoured, but it’s badly buried inside a fortress of polymer! No, seriously, whenever I needed to just lock the slide back to place the gun on the bench, I typically had to take 2 or 3 stabs at it to get my thumb to engage and push up on the lever. The problem is that the polymer “cage” surrounding the bottom and sides prevents your thumb from engaging it properly. 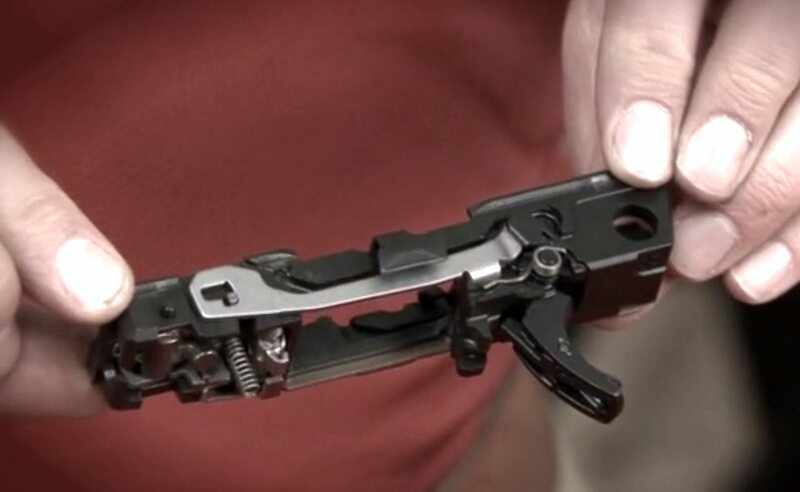 Hey, Ruger, it’s a slide LOCK (not a “release”). If you hinder locking engagement, it makes the control pretty useless. Likely the most remarkable of the Ruger American Pistol’s features is a modular chassis. This feature has a couple of important consequences. Firstly, the American Pistol’s grip frame isn’t the serialized part. It isn’t “a firearm” per the ATF’s definition of the term. 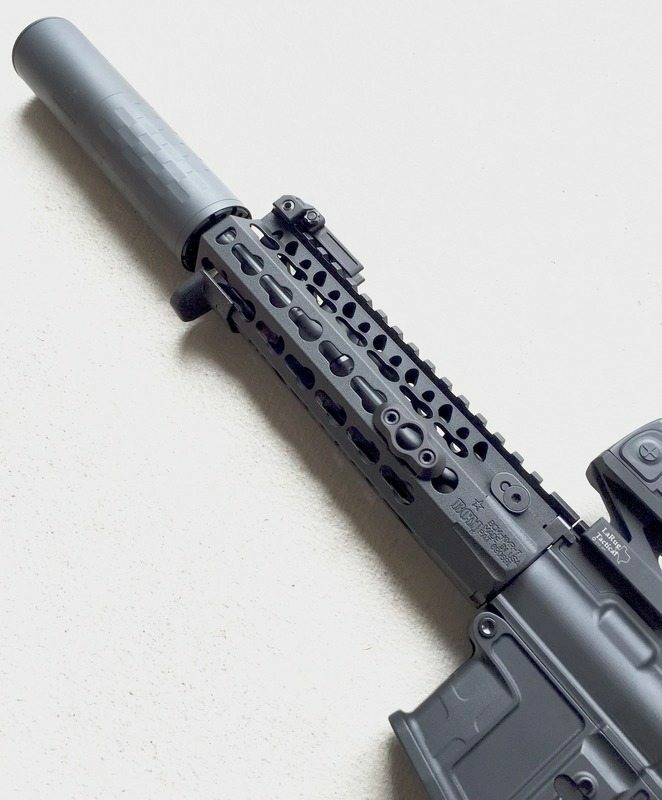 The firearm is the serialized, stainless steel chassis insert. This means you could change frames without a “firearm” purchase. Nice. Some other notable features include the fact that, unlike most Rugers, the pistol lacks a magazine disconnect. So you can still fire a chambered round when there’s no magazine in the gun; useful for some self-defense scenarios. Another nice feature is the fact that there’s no external safety (and no pistol should have one!). The frame features a 4-stop picatinny rail for lights or lasers. The sights, as mentioned before, are adjustable and replaceable. I’d recommend a replacement, as even though these Novak sights are nice, the rear sight is sloped, which makes one-handed slide racking on a belt or table difficult; not so good for self defense. I found the Ruger American Pistol easy to shoot accurately! Whether from the recoil-reduction engineering, low-ish bore axis, grip angle, or whatever, this pistol is a tack driver. Interchangeable, varied-size backstraps are a nice addition. The ambi controls and adjustable dovetail sights front and rear are a big plus. The modular chassis system is a great idea and one that I’d like to see more manufacturers adopt. There are some problems with the trigger and I don’t like how the slide lock is buried. The grip texture is pretty unacceptable in my opinion, but this can be remedied as with any polymer pistol. At 30 ounces empty, it’s pretty heavy even for a service model pistol. It’s a comfortable-to-hold pistol. The three sizes of interchangeable, wrap-around backstraps allow for a more personal fit for reach and palm swell. Some may not like the trigger feel on the finger. The long trigger reset is a knock against it. Also, the lack of appropriate support-hand texturing makes multi-shot control more difficult. Other than these flaws, I found it to have very little muzzle flip and is generally a good shooter. I found it to be a tack driver! I can’t really speak to reliability given my limited exposure to it. There are already plenty of sights and holsters for the Ruger American Pistol. I’ve heard that aftermarket triggers/parts are coming. The adjustable backstraps allow for better personal preference fit. The modular chassis will allow you to replace the whole frame and still keep your “gun,” should the need or desire strike you. Despite a few flaws, I found the Ruger American Pistol to be surprisingly good. All pistols have their flaws and all shooters have their nitpicky preferences, so I’d recommend giving this one a try before you leap to purchase or decide not to. Eagle Gun Range has one for rent, so give this one a try next time you visit! 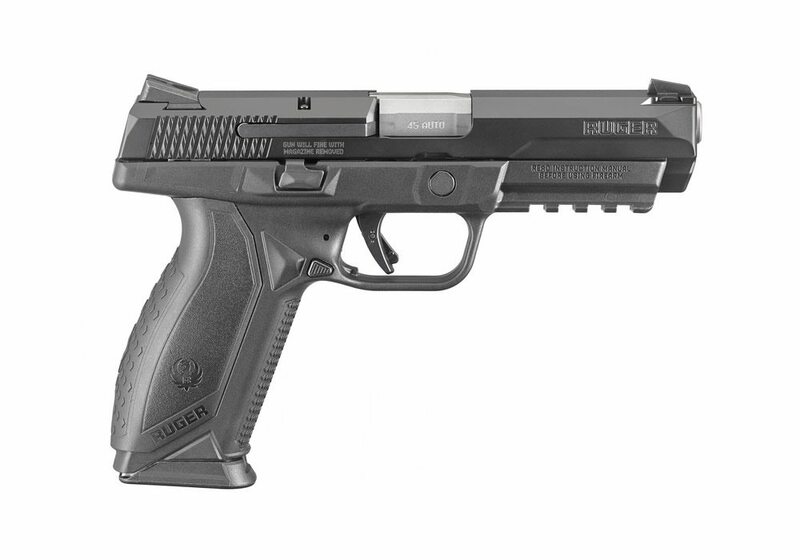 I would love to see a review v of the Ruger 9e. It’s a much more affordable entry gun for many of us, and I would like to see how much one really gives up in the accuracy department compared to the American or even the XD Mod 2. I bought an American pistol, fired one box of ammo and sold it the same day. I had two issues, one with the trigger and the other with the frame. The trigger would sometimes not activate causing the pistol to not fire. Apparently the trigger safety was not releasing the trigger. To overcome this I had to change my grip allowing my medium finger to purchase the trigger better. However, this caused the trigger safety to bite my finger causing a bruise/blood blister. Apparently the side to side gap between the trigger and the safety allowed a portion of my finger to get in between. Then firing only one box of ammo I noticed the frame rubbing an abrasion on my knuckle of my hand at the trigger finger. In short I found the American to be uncomfortable to shoot. Accuracy was only fair probably because of the distraction of the discomfort of shooting. I”ve had good luck with My 45cal Model, Only disappointment is rear sight isn’t adjustable for elevation & don’t want to spend extra money for no return in value. Shoots 6ins low at 15yrds.